History. Tradition. Passion. Success. It takes more than the 15 men out there on the pitch. 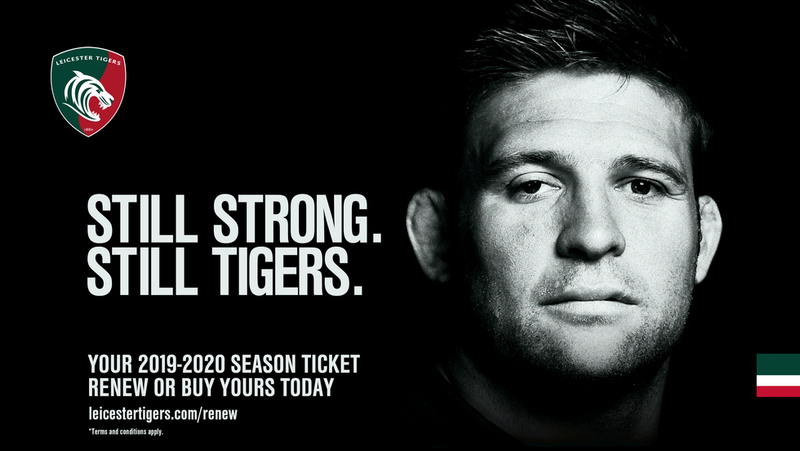 Tigers are one of the world’s biggest rugby clubs and in the moments that matter, it's the ‘16th man’ that makes all the difference, which is why your club needs you more than ever. Leicester Tigers 2019/20 season ticket offers the best value, guaranteeing your place at Welford Road for eleven Gallagher Premiership games, three European games and two Premiership Cup games, as well as every Tigers Premiership Shield home game. There's nothing like the atmosphere on matchday at rugby's iconic Welford Road. It's STILL about the rugby, it’s STILL about supporting your club and it’s STILL about having a great time. Win or lose. We do it together. We still keep fighting, we’re still Leicester Tigers. Whether you’re a lifelong supporter, a regular ticket holder, or are new to #TigersFamily, the players and staff at Leicester Tigers hope to welcome you back for the 2019/20 season and appreciate your continued support. Leicester Tigers season ticket holders who renew before Saturday, April 6, will have their names entered into a draw to attend an exclusive summer BBQ with Tigers players and coaches at the club’s Oval Park Training Ground. More than 100 lucky fans will meet the club’s players and coaching staff at the summer event. Season ticket holders who pay by direct debit will be automatically entered into the draw.